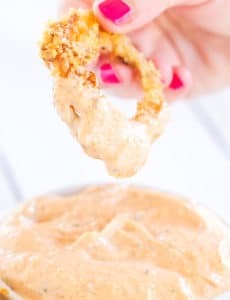 This dipping sauce tastes exactly like the one you'll find at Outback Steakhouse and is perfect for your favorite onion rings! In a small bowl, stir together all of the ingredients until completely combined. Serve immediately or cover and refrigerate until ready to serve. Leftover dipping sauce can be stored in the refrigerator, covered, for up to 1 week.